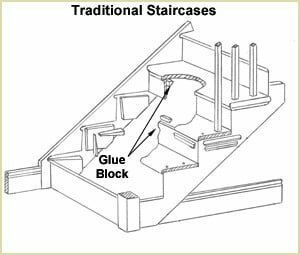 This glossary of staircase related terminology is by no means exhaustive but does detail the most common and basic terms used in staircase construction and balustrading installation. 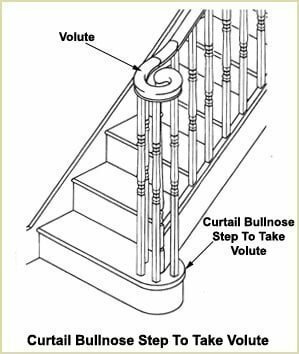 Baluster/Spindle – The vertical member, plain or decorative, that acts as the infill between the handrail and baserail (or tread if cut string). 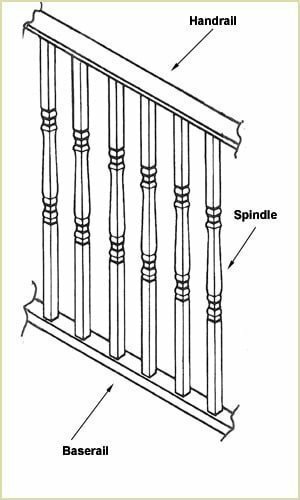 Baluster - An American word for spindle. 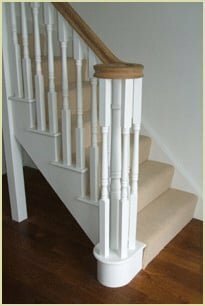 If you would like to find out more about the baluster, please take a look at our balusters page. 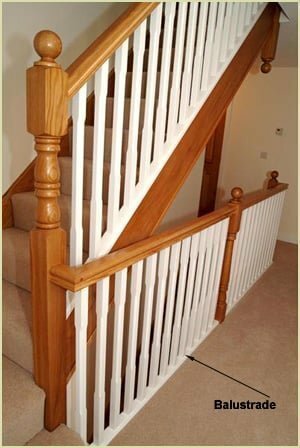 Balustrade – Collective name for the complete assembly of handrails, baserails, newels, spindles, infill and newel caps. 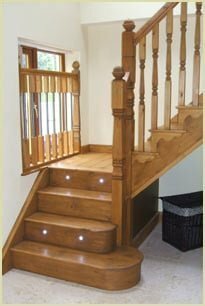 For more information about balustrades, please see our balustrades page. 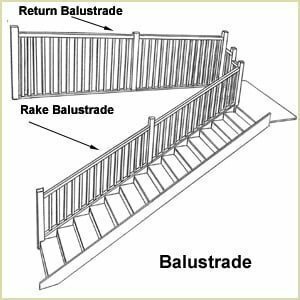 Baserail - The Baserail sits on top of the string and holds the spindles in place. 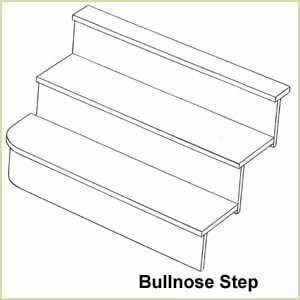 Bullnose Step – Sits at the bottom of the stairs with one or both ends of the step having a quarter circle design. 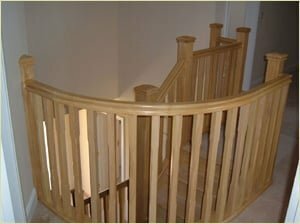 Circular Stair – Alternate name for a curved or helical or part curved staircase. 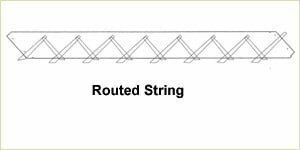 Closed String – A string with the face housed/trenched to accommodate treads and risers, so their profile cannot be seen. (See Cut or Open String). 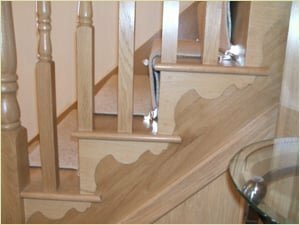 Continuous Handrail – Using straight lengths of handrail connected to handrail fittings and ramps, the handrail flows over the tops of newel turnings creating a continuous run of handrail. 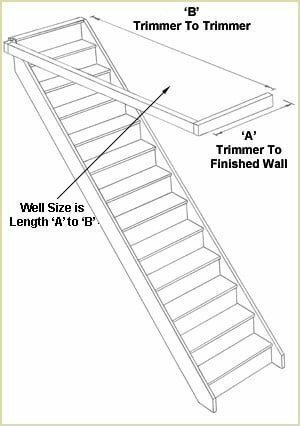 Cover Moulding - A moulding that covers the ceiling line between the plasterboard and the staircase apron. 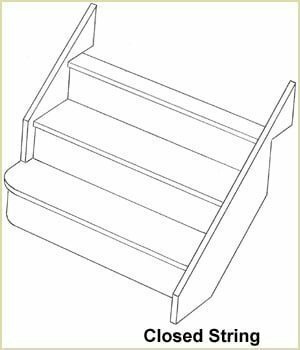 Curtail Step – A decorative shaped step at the bottom of the stairs usually accommodating the volute and volute newel turning of the Continuous Handrail System. 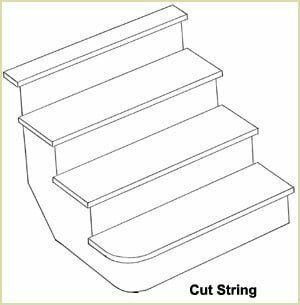 Cut or Open String – A string with the upper edge cut away to the shape of the treads and risers so that their profile can be seen from the side. 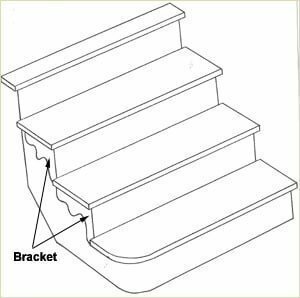 Cut String with Bracket - A String with the upper part of the string cut away to follow the shape of the treads, but a bracket, of various designs, can be seen from a side profile. 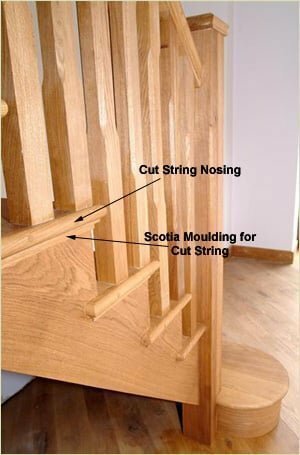 Cut String Nosing – Tread nosing applied to the outside of a tread to cover end grain. 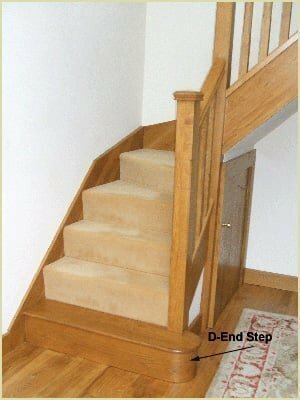 D-End Step - Which means that the tread passes the newel post and returns back into the side of the newel. 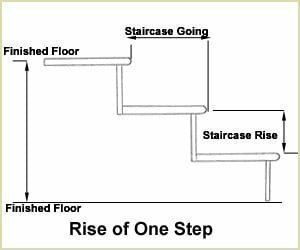 Flights of Stairs – An uninterrupted series of steps reaching from one landing to the next. Flights may be straight or curved. 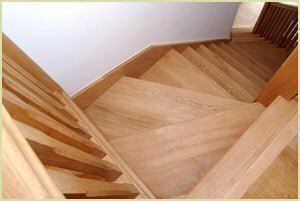 Floor to Floor Height – The total rise of a staircase, measured from the top of the finished lower floor to the top of the finished upper floor. 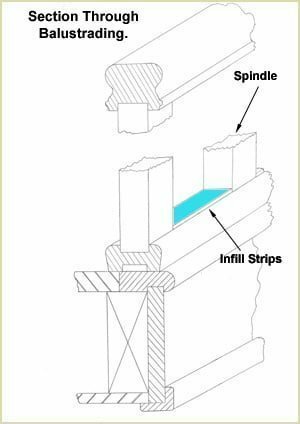 Flutes – Decorative vertical grooves sometimes routed into the wood surface of spindles or newel posts. 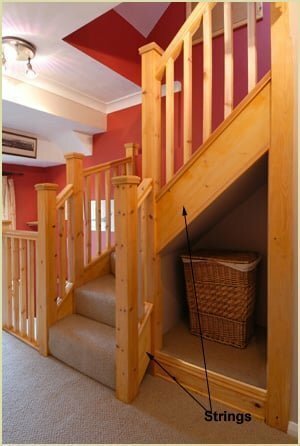 Freestanding – Staircase which is not supported by walls. Open underneath. 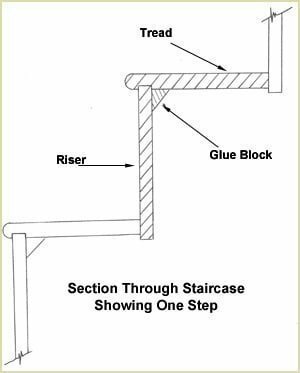 Glue Blocks – Blocks of wood attached to the underside of the stair at the junction of the riser and tread. 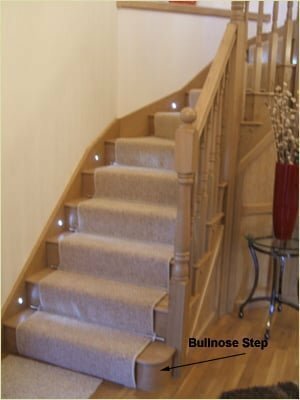 These secure the risers and treads together and are used to prevent movement and so minimise squeaks. 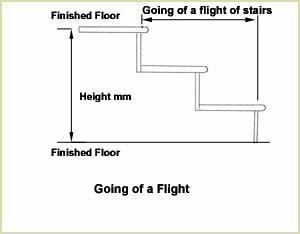 Going – the going of a flight of stairs is the horizontal distance between the face of the first and last risers. 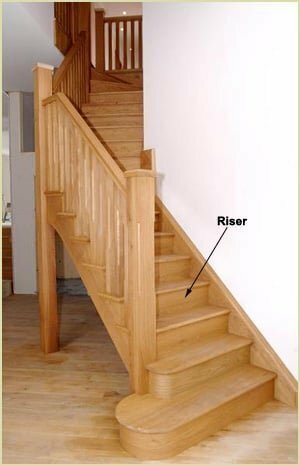 The individual going of a step is measured from face of riser to face of riser and for domestic use should be a minimum of 220mm. 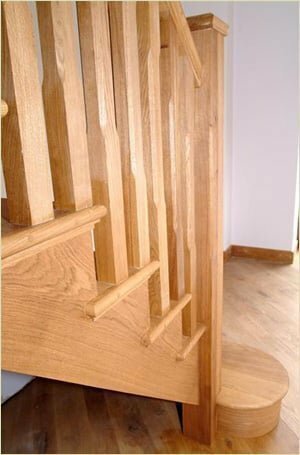 Gooseneck – A handrail fitting consisting of an up-ramp, and a vertical turn. 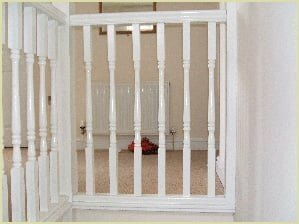 It is used at a landing or balcony to raise the rake handrail to the height of the balcony handrail. Gradient of a staircase – The ratio between the going (horizontal) and the rise (vertical); the angle of inclination. Guardrail – Otherwise known as the handrail. 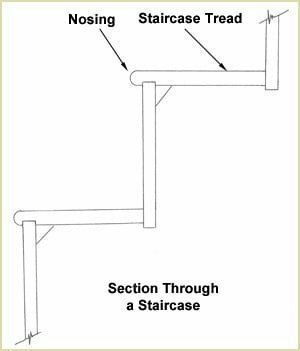 Handrail – A protective rail designed to prevent people or objects from falling into open stairwell. 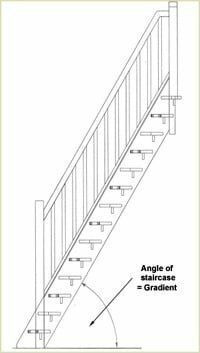 A moulded rail following the pitch, or rake of the staircase – which also forms the top/upper edge of the balustrading. Headroom – The vertical distance from the lowest point of the ceiling above the stair to the tread nosing. This is relevant to comply with current Building Regulations. 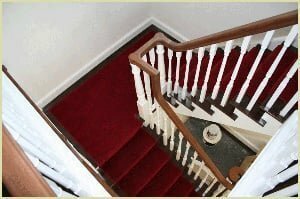 A Headroom of 2m is required at all points on and off a staircase and as you pass down a staircase. 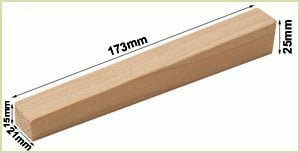 Infill Strips – A thin wooden strip that fills the grooved space between spindles in both the baserail and underside of the handrail. (Sometimes call fillet). Joists - Joists span the walls. Chipboard flooring is usually screwed on top of the joists. 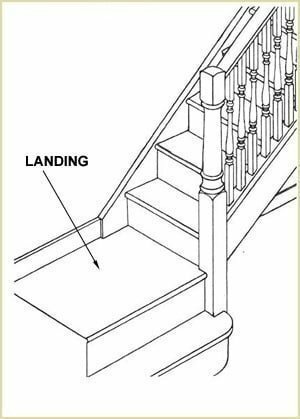 Landing Nosing - Nosing that sits around a Landing. 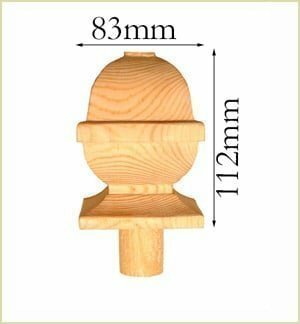 Newel Cap (Also referred to as Finial) - The ornamental top of the newel post. Often carved shaped or turned. 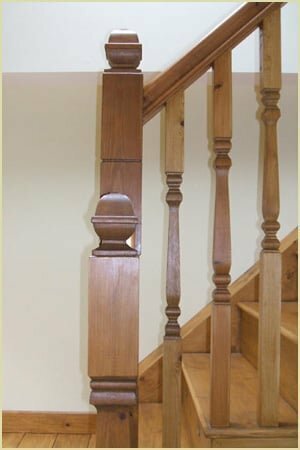 Newel Post – Accommodates the strings, handrails and treads/risers of stairs. 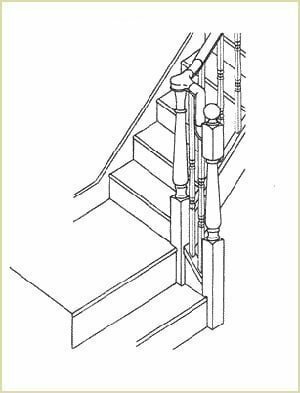 Newel Base – Structural support that forms the lower section into which Newel Post is attached. Nosing – The edge of the tread projecting beyond the face of the riser. 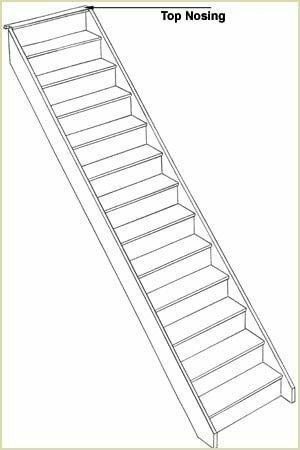 Open Risers – A staircase designed with only the horizontal surfaces of the treads fixed to the stair strings. The vertical spaces between treads are open. 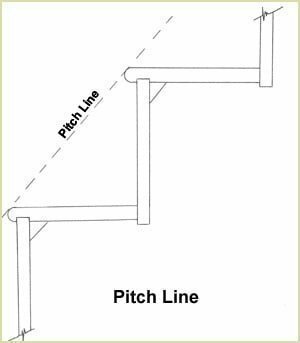 Pitch – The angle between the pitch line and the horizontal. (or gradient of a staircase). 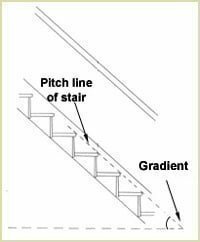 Pitch Line – The notional line connecting the nosings of all treads in a flight of stairs. 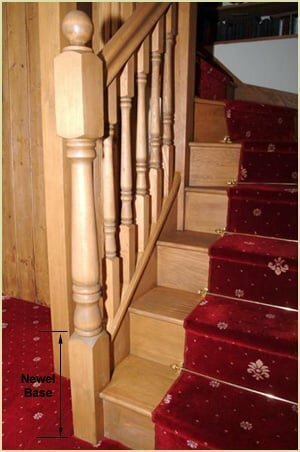 Platform – The landing which is the top tread on a spiral staircase. Plumb – Perfectly vertical, perpendicular with the floor. 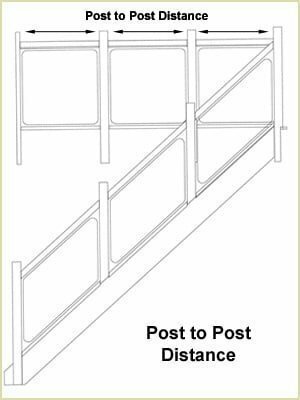 Post-To-Post – A Balustrade system, where the handrail is not continuous. 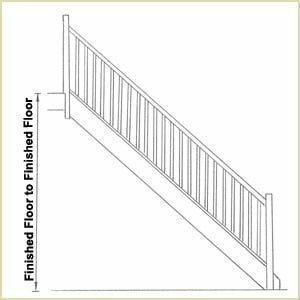 Rail System/Railings – The balustrade. 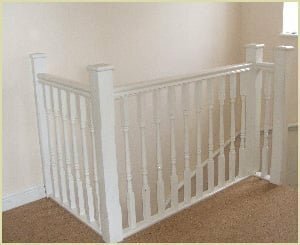 Used to describe a complete rail system consisting of the handrail,spindles and baserail. 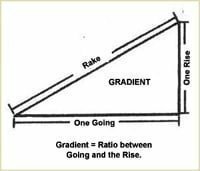 Rake – The pitch of the stairs. 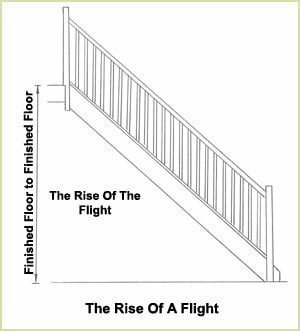 Rise – The rise of a flight is the vertical distance between the floors or landings connected by the flight. The individual rise is the vertical measurement from top of tread to top of tread. 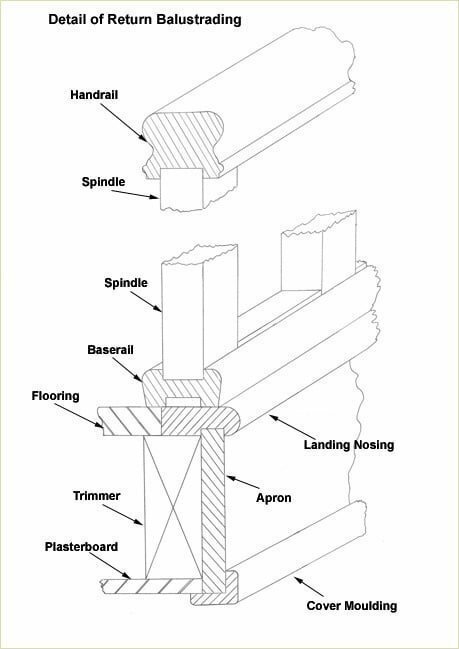 Routed string – A string which has been routed out for the insertion of treads, risers and wedges. Also known as box string. 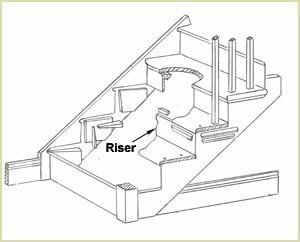 Run – The horizontal distance covered by the entire staircase. Technically its the distance from the trimmer face to front of the first steps nosing. 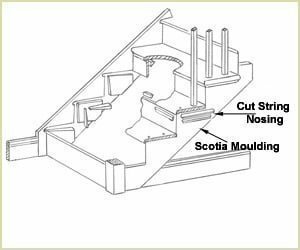 Scotia Moulding - The timber moulding that sits around a cut string staircase. 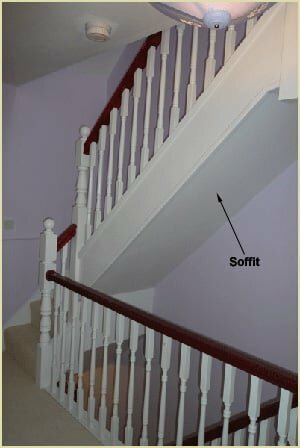 Soffit – The visible sloping under-surface between stair strings. 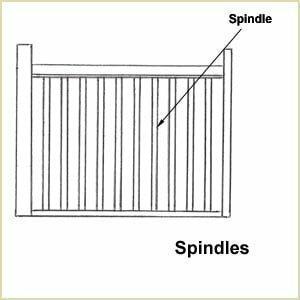 Spindles – Turned, carved or otherwise vertical sections placed between the handrail and the stair tread or string. 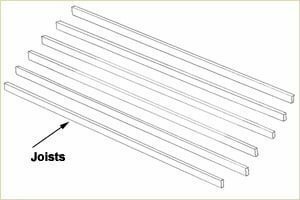 Also known as balusters. 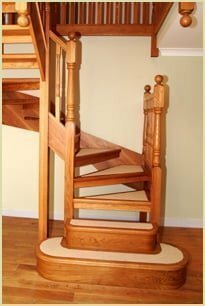 Spiral staircase – Stairs, which rise regularly around a cylindrical pole. 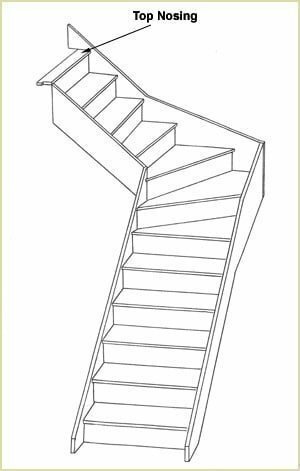 Staircase – The entire structure relating to a stair, comprising steps, treads, risers, strings, balustrading, landings etc. 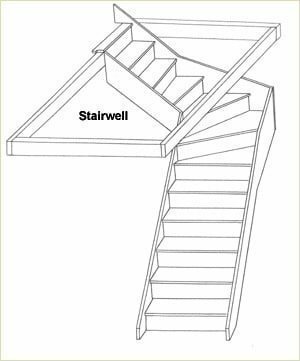 Stairwell – The space/void provided for the stairs. 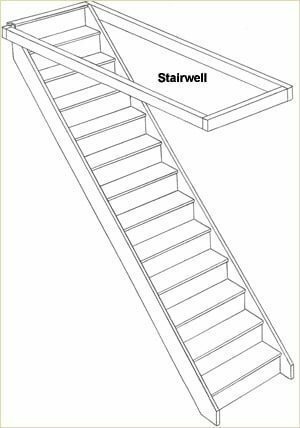 Stair Direction – Either right or left-hand. 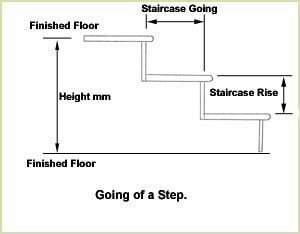 Determined by turn a staircase makes when facing it from the bottom. Step – The tread and riser combined. (See area shaded in drawing). 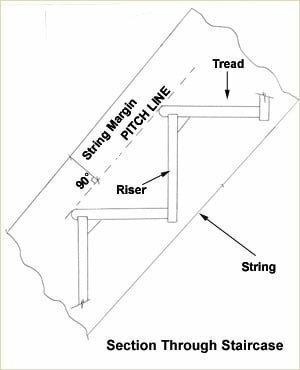 String Margin – The distance between the top of the string and the pitch line measured at 90° to the pitch line. 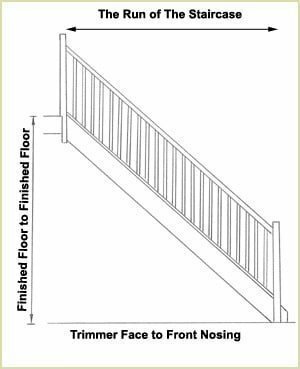 Top Nosing – Sometimes called the Lander Tread, narrow tread nosing situated above the top riser or along the upper edge of a balcony. 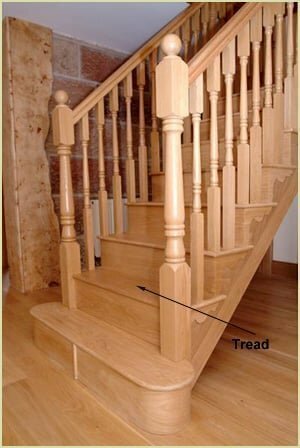 This gives the appearance of a tread at the top of the staircase. 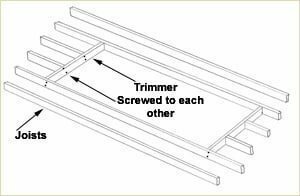 Trimmer Joists - These are used to construct a well suitable for the opening of the staircase. 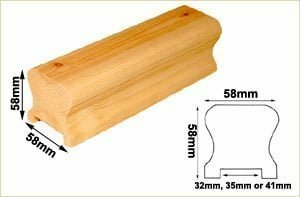 These are held together with screws or joist hinges. (See Joists). 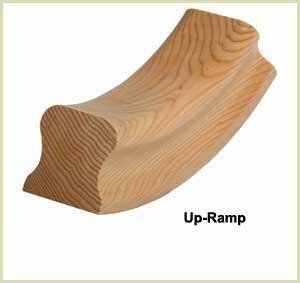 Up Easing or Up-Ramp – A handrail fitting which joins two handrails or fittings at different angles in a graceful, pleasing manner. 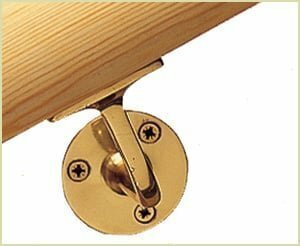 Wall Rail – A handrail which is mounted onto a wall and supported by wall brackets rather than newels or balusters. 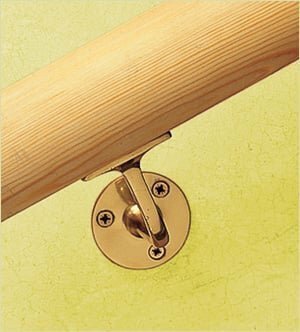 Wall Rail Brackets – Metal support for wall rail. 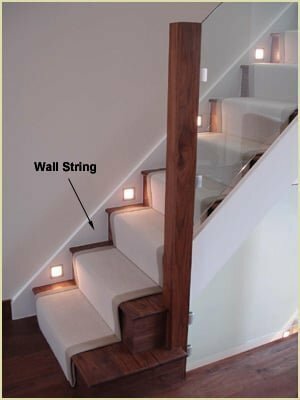 Wall String – The string of a staircase fixed flush with a wall. 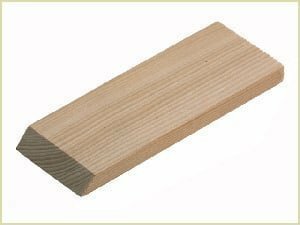 Wedges – Tapered blocks of wood, coated in glue and used to drive treads and risers tightly into a routed string. 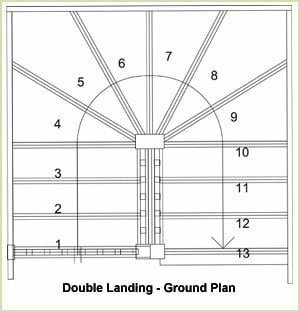 Well Opening – The opening in the upper floor (lower floor ceiling) for placement of a staircase. From Trimmer to Trimmer, see Length 'A' to 'B' below. 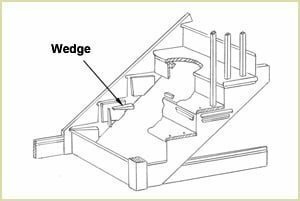 Winders – Are radiating steps narrower at one end that are used to change the direction of a stairs through 90° or 180°. 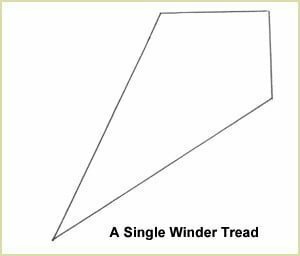 Winder Tread – Tread with a greater run on one side than the other. 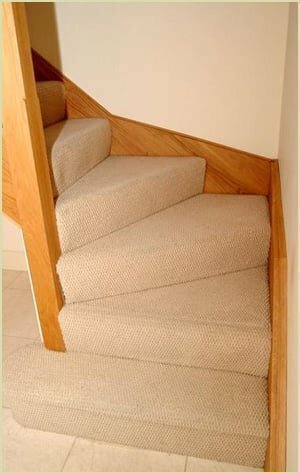 Used on circular, spiral or winder staircases. 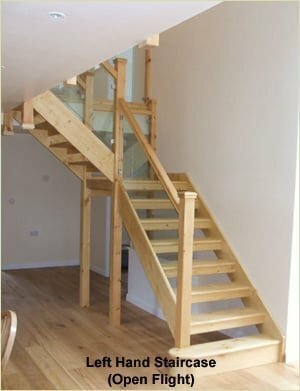 Pear Stairs can advise you on your staircase or stair parts , remember if you have any questions about your staircase or stair parts don't hesitate to phone us. 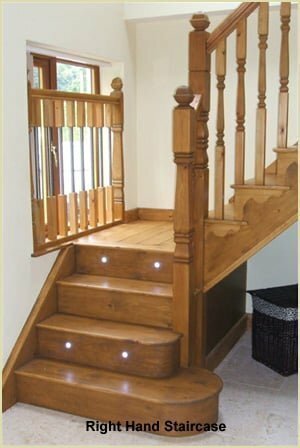 We are a very friendly company, phone Pear Stairs on 01938 553311.